•Last Chance to Get This Version of A.F.A.R. on Sale on CD! 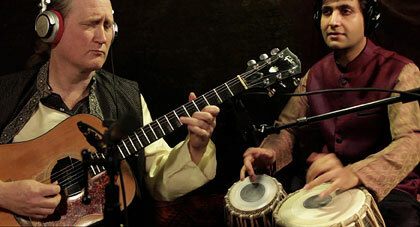 Learn about Indian raga and tala and hear how they mix with passionate flamenco, energetic Celtic music, and other world music traditions in these free library programs by Ancient Future featuring world guitar pioneer Matthew Montfort and renowned Indian tabla virtuoso Vishal Nagar. The program will feature music from the ground breaking world music recordings of Ancient Future, including the first audio/video release in Ancient Future history, 2014's Yearning for the Wind﻿. All the concerts are free to the public. For more info, visit sonomalibrary.org/events. This intimate evening of music at the historic Mazza Castle in Pacifica, California, features Matthew Montfort and Vishal Nagar. 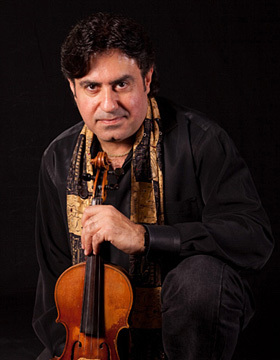 Special guest Georges Lammam, the Arabic violin master on Planet Passion, will sit in with the duet on a number of pieces. This will be the first time that Georges Lammam and Vishal Nagar perform together, so make sure to reserve tickets early so that you can witness the very first meeting of these master musicians! $40 per guest, includes wine and refreshments. Limited to 45 seats. Reserve tickets early at Brown Paper Tickets. 4 PM - Gather with refreshments. Music begins promptly at 5 PM. Last Chance to Get This Version of A.F.A.R. on Sale on CD! The Archive of Future Ancient Recordings, Ancient Future's fan funded recording project, has 10 tracks and 70 minutes of music in it so far, and supporters of the archive can purchase a limited edition CD of all of these tracks, appropriately titled A.F.A.R. So Far. Another eleven and a half minutes of music have been recorded, mixed, and mastered for the archive! We just need to finalize the licensing fee for Ancient Future's first ever and very unique cover of a popular song. In the meantime, we have just a few CDs left of the last version of the archive that will fit on one CD. This is your last chance to get one of these CDs, and it's on sale at a reduced price of only $15! Because the archive will soon not fit on a CD, the next A.F.A.R. CD offering will be The Best of A.F.A.R. So Far and won't have all of the tracks that have been added to the archive. Please become a supporter at one of the levels below, starting at just $15. Once you become a supporter at any level, you will receive all of the tracks in the archive (and all of the tracks that will be added in the future), and you will be eligible to buy the CD-R. Only a very few copies of each edition of A.F.A.R. So Far are made, as new tracks are added as money is raised.